Although the details, types of machinery, and techniques vary from one chocolate maker to another, the following guide should cover the basic foundation of how our chocolate is made. There are 2 main stages that the beans from our farm have to go through in its journey to become chocolate, which are: Pre-processing and Processing. However, the Pre-processing stage itself consists of 2 sub-stages, which are: Pre-harvest and Post-harvest. 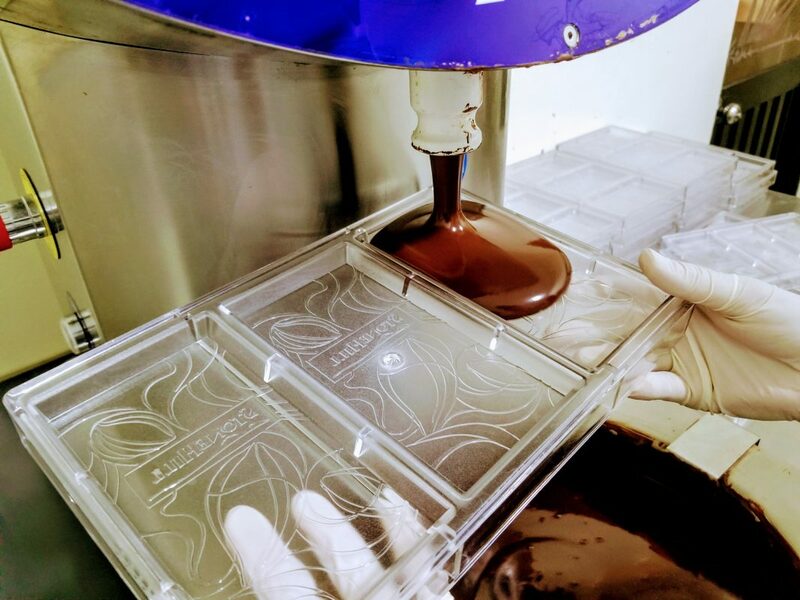 All in all, the Pre-harvest and Post-harvest stages each contribute about 35% to the final outcome of the chocolate while Processing contributes to the remaining 30%. This stage mainly concerns the agricultural side of cacao production which includes variety selection, plant cultivation, fertilizer application and pests and disease control. Suitable soil and farm location should be selected beforehand. While cacao trees can grow anywhere if properly taken care of, the type of soil and location can affect the trees in many ways. Cacao seeds are planted then grow into seedlings. The selected cacao varieties are then grafted to the seedlings. After a period of maturing in the nursery, the grafted seedlings will be planted in the open field. The young cacao trees will grow for about three years before entering their production stage. During that time, the cacao trees are carefully looked after, since how the trees are cultivated can affect the outcome of the beans as well. 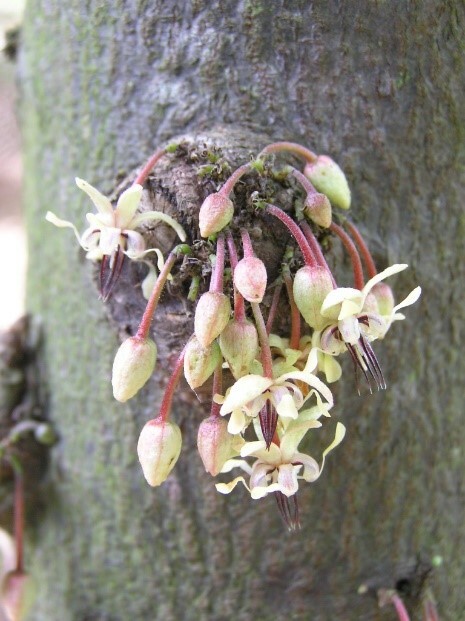 After maturing, the cacao trees will begin to bear flowers which will take about 5 – 6 months to become ripe cacao pods. The ripe cacao pods are then carefully harvested by hand. Since new pods will continue to come out of the old pod’s cushion, a lot of effort is given during harvesting so that these cushions are not damaged at all. This stage mainly concerns with the treatment of fresh cacao pods in order to turn them into fermented dried cacao beans and prepare them for processing which includes fermentation, drying and storage. The cacao pods are then gathered and stored. The storage period will vary, depending on each fermentery. The cacao pods are broken, and the cacao beans are separated from the pods. The beans are then fermented and turned over the course of 4 to 6 days to induce the development of chocolate flavor precursors. The fermenter will monitor the condition of the cacao beans, turn them when necessary and release the fermented wet beans if they are ready. After fermentation, the cacao beans are sun dried for 7 to 10 days until they reach the desired moisture level. Ideally, when cacao is done fermenting, the fermentation rate should be between 75% to 85%. This is because the cacao beans will continue to ferment, even during drying and storage, albeit much slower. Too high of a fermentation rate can lead to overfermentation and rotting, while too low will prevent us from achieving full flavour development along with an overly astringent and bitter taste. Once adequately dried, the cacao beans are moved to storage to await processing. This stage mainly concerns with the processing of fermented dried cacao beans into chocolate which includes roasting, breaking, winnowing, milling, conching, tempering and molding the chocolate. Roasting: The cacao beans are roasted. Heating the fermented beans triggers the Maillard reaction, releasing the chocolate flavour precursor within the beans, creating the signature chocolate flavour and smell that we all love. Breaking: The roasted cacao beans are then broken into smaller pieces called nibs. After going through the breaker, we get a mixture of cacao nibs and broken cacao bean shells. Winnowing: The mixture of cacao nibs and broken cacao bean shells is run through a winnower where the blown air will separate the two. Milling and conching: The cacao nibs are then put into a miller to be ground with sugar into a fine, liquid chocolate mass. The amount of sugar added in this stage determines the percentage of the chocolate. For example: a 72% chocolate bar will contain 72% cacao and the remaining 28% will be sugar. Once reached the required fineness, the chocolate mass is removed from the miller for tempering. At this stage, they are fundamentally the final product. Tempering: the chocolate is tempered with heat and cold to harden and give the chocolate its signature shine and snap. Molding and packaging: The chocolate is molded into shape and then packaged for sale.